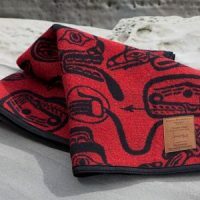 This wonderful creation entitled “Dreamtime” by James Hart shows classic Haida images in bold red and black colors. This style is traditional of this Indigenous art form. An Italian Jacquard weave, this wool blanket offers richness of color and design. Each blanket is also bordered with a double-stitched, hand-sewn complementary felt edging. Finally, it is hand trimmed for the ultimate finished look. The end result: an elegant, unique, beautiful blanket that will be treasured for years to come and also makes a fantastic gift. This blanket is made in Canada from Italian wool, blended with acrylic and polyester to add softness and richness of color. Licensed exclusively to Kanata Blanket Company by the Canadian Museum of History. The museum is recognized as one of the premier cultural facilities of the twentieth century. It promotes a greater understanding of cultural identity, history and culture. 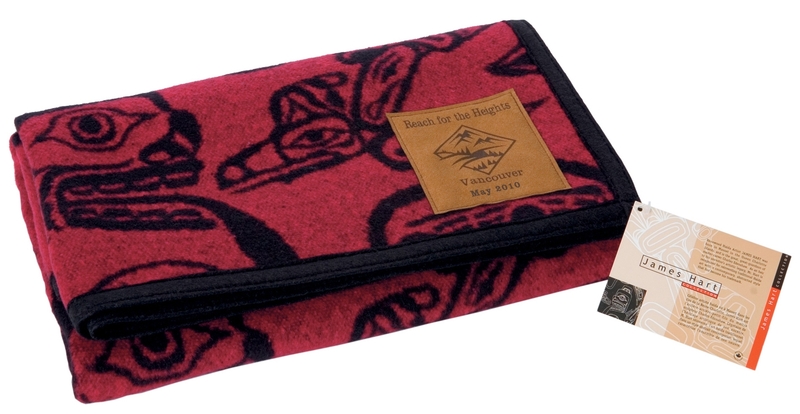 Royalties from sales of this item go to support the development of Indigenous art and culture. Here at Kanata, we endeavor to capture both traditional and contemporary designs with licensing programs that give back to the artist, the organization and the community. Learn more about James Hart. Dry cleaning recommended. Can be hand washed in cold and hang to dry. Do not bleach. Packaged in a cardboard suitcase box. 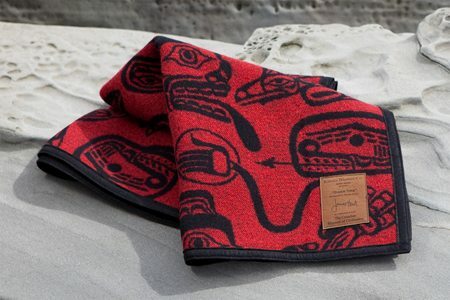 This wonderful creation entitled “Dreamtime” by James Hart shows classic Haida images in bold red and black colors. An Italian Jacquard weave, this wool blanket offers richness of color and design. 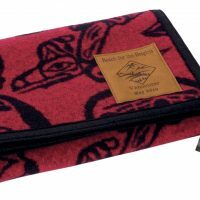 Each blanket is bordered with a double-stitched, hand-sewn complementary felt edging and then hand trimmed for the ultimate finished look. Available in two sizes: 40″ x 60″ | 60″ x 80″. 45% acrylic, 25% wool, 25% polyester.